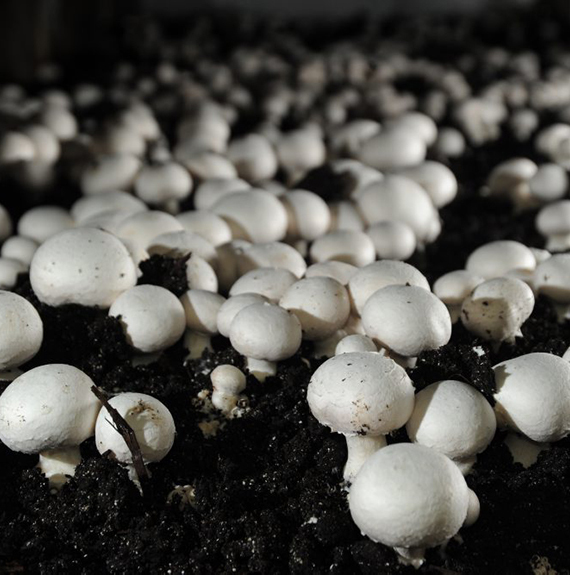 We have been providing quality mushroom casing soil for worldwide clients in the mushroom growing industry. The company was founded in 1987 by Tommy and Kay O’Harte. 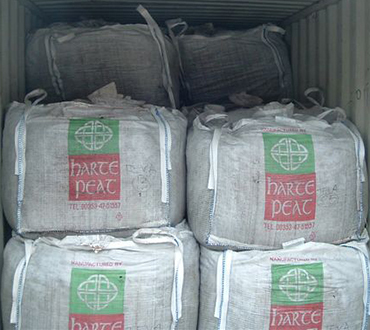 Lichen is the exclusive supplier of Harte Peat in Africa, supplying more than 80% of the mushroom industry volume. Being a dominant and trusted supplier is a valuable position to endorse the other Lichen growing medium brands as a trusted supplier for new clients. Harte Peat Ireland has been producing casing for the worldwide market for over 20 years. The success of our business has been built on meeting our customers’ expectations in relation to product quality, mix quality and freedom from disease. Whatever your growing system, Harte Peat can provide casing to meet your requirements. We supply 3 different bag sizes. Bags are shipped in 20ft 6-meter containers and Harte Peat SA take care of all of the logistics of shipping. 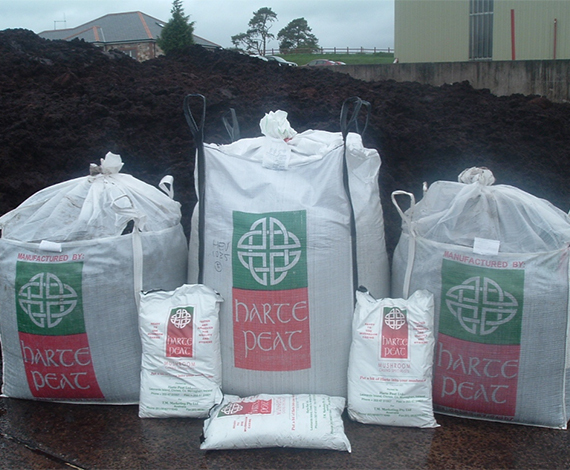 Please Note the only Harte Peat available less than a 24 ton container ex Ireland delivered to farm is the 50L Bag, ±50bags=1200kg per pallet. Can be collected or delivered ex warehouse Johannesburg. 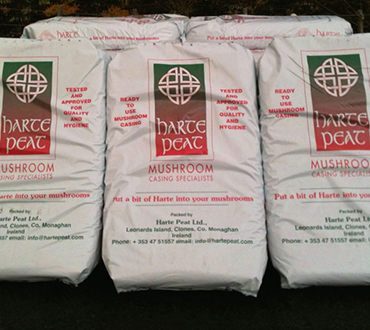 For a detailed watering regime using Harte Peat Mushroom Casing Soil, please download a helpful PDF below. 2,5m³ bags 20 bags in a 6-meter per container. Weight ±1250kg per bag. Harte Peat own and control their own material resource to minimise the possibility of disease or tramp materials from getting into the mix. Peat to be used in the mix is only extracted as it is required to meet customer needs. 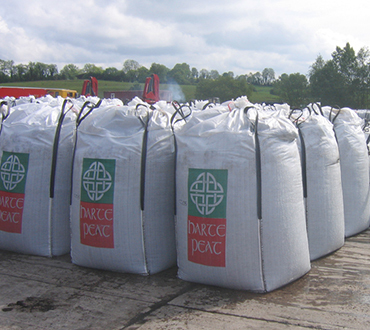 Following extraction, the raw peat is then transported to our production facility in Clones. The peat is then mixed to order as different customers have different requirements. The peat is mixed with Spent Sugar Beet Lime which has been weathered and stored for more than 2 years and also heat treated. Each batch of casing soil is tested in an independent and approved laboratory for Salmonella, E-Coli and Listeria sp. before it is dispatched for use. Click the button below for our Material Safety Data Sheet. Considering Becoming a White & Brown Mushroom Farmer? Where are you based, city town, country? Have you grown white and brown mushrooms before? 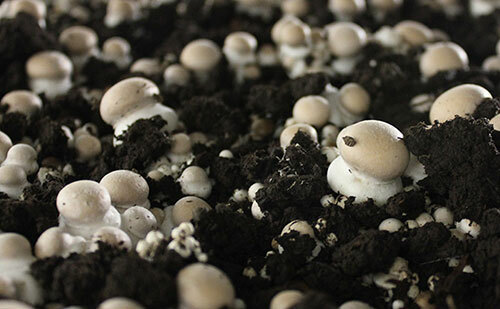 Most importantly have you made compost before for white and brown mushroom growing? We can provide spawn compost, it comes in a reefer container being frozen. You need to defrost and use all at once, or have a freezer to store and use as you need. NB We cater for white and brown mushrooms only, not exotic mushrooms! This is a very technical business. We would suggest you contact Mel Meyer +27-72-964-1817 who is a South African consultant in the mushroom growing industry and charges for his time. Rule 1 The most important rule in mushroom growing industry is compost, if you cannot make mushroom compost you fail. It is a very specific compost. Rule 5 Good quality peat. 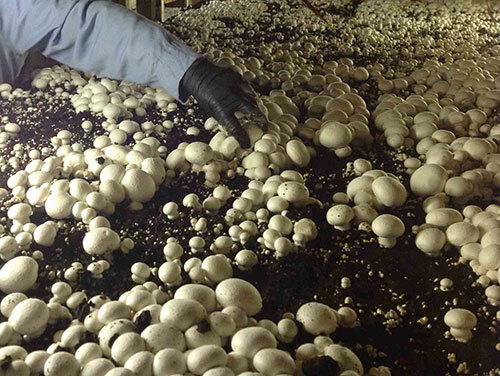 To supply mushrooms you need to produce mushrooms at least every second day so that you can supply your clients. To do this you need more than one room as each room gives you a flush which is a harvest. This means you need 12-17 weeks stock of straw, chicken manure, Harte peat, spawn so that you can on an ongoing basis produce mushrooms and rotate the rooms. 1) Produce compost – takes 9 weeks or longer. 2) Move compost into the rooms and apply spawn. Allow spawn run. 3) Mushrooms pin and grow through the peat. 4) Harvest mushrooms on a rotational process. 5) Start from point one again so that you have continuous production. Both wet and dry bubble continues to cause problems for growers. Verticillium (dry bubble) is particularly troublesome. On a recent visit to Ireland a Dutch mushroom consultant, Henk van Gerwen, gave a talk to two of our Discussion Groups about this problem as he saw it. Bubble is soil borne and therefore there is a potential source on every unit from soil contamination. Wheels of casing lorries backing across lanes or stoned areas onto the concrete apron to tip casing. Soiled water running down/across aprons with tipped casing during or after heavy rain. Older diseased tunnels possibly exhausting spores. Verticillium on casing will only begin to grow at pinning in a reaction to changes in casing sugar levels. Each point of infection produces spores in 24 hours. One point of infection can produce 125 million spores. Spores are released in clusters and carried largely by people/pickers, flies and dust. They are very sticky and easily spread. Watering onto a diseased crop is probably the best way to spread spores within the crop. If you spread spores at watering you will see new infection in the proximity of the original source in 4 to 7 days (in the 6/7 adjacent bags). Experiments in Holland showed that at very high disease levels, Sporgon was ineffective in controlling spread but as levels reduced it became useful again. Train pickers to identify initial infection. Inform pickers and other staff of their role in spreading disease. Clean clothes/aprons for staff daily. The day of disease outbreak can help you work back to most likely infection time (4-7 days earlier). Eliminate fly problems. Flies are the perfect way to spread sticky spores. Areas where pickers and other staff congregate such as canteens would be high risk for cross infection (i.e) casing personnel, people emptying tunnels and pickers. Cookout is the best way of disinfecting. Surface drench with a suitable disinfectant the day before emptying taking care to drench floors as well. For spot treatment, cover disease with tissue and cover generously with salt. Removing disease from casing should only be done by someone who understands exactly what they’re doing. Removing diseased spots carelessly is the perfect way to worsen the problem. In Holland air intake and exhaust air is filtered.